Like innocents arriving through a portal from the Pleistocene past, South America’s giant armadillos and giant anteaters naively wander a gauntlet of modern dangers. To give voice to these quiet creatures, a team of conservationists led by Dr. Arnaud Desbiez and supported by zoos continues to raise awareness as they answer foundational questions that just may let these creatures survive in the today’s Anthropocene age. 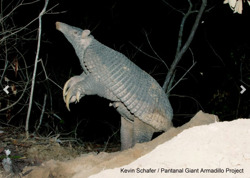 Their efforts were recently rewarded with discovering a new baby giant armadillo as well as the chance to solve one of the gravest threats to giant anteaters. A far cry from their diminutive nine-banded armadillo cousins in the United States, giant armadillos weigh up to 50 kg (110 lbs.) and measure up to 1.5 m (5 ft.) long with impressive claws that can reach over 20 cm (8 in.). Little was known of these creatures until Desbiez created the Giant Armadillo Project in Brazil in 2010. Even most locals in their range had never seen one. 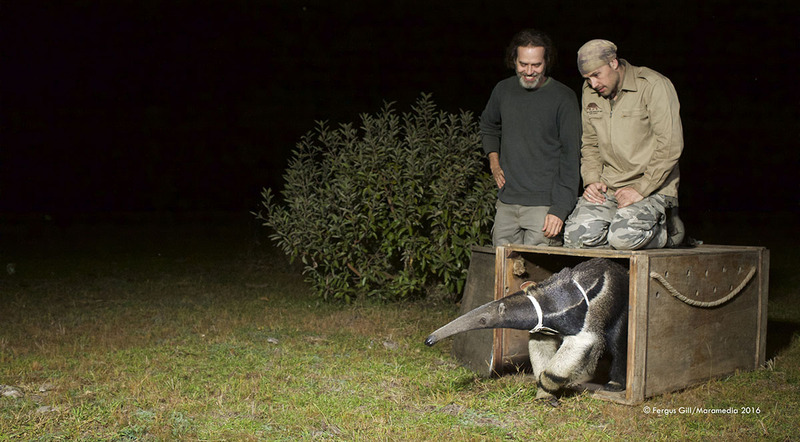 While studying these nocturnal creatures, the team had the opportunity to observe challenges facing other species and has recently expanded their team to launch a new project to address the shockingly deadly threat of roadkill: Anteaters & Highways. While listed by the IUCN as Vulnerable to extinction across its range, the giant anteater is already extinct in several former range countries and some Brazilian states. During a preliminary study by the team, over 1000 km (621 miles) of paved highway in the Brazilian state of Mato Grosso do Sul were monitored twice a month for a year. 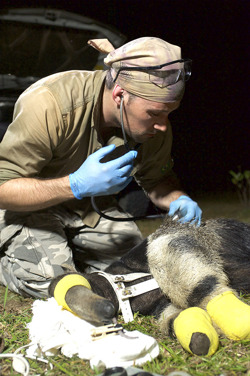 The results were shocking with 136 giant anteaters found among the carcasses. The tight focus of the Anteaters & Highways project is to reduce this deadly threat. GPS harnesses placed on giant anteaters in the Pantanal by the team have already revealed the challenge will be substantial as preliminary analysis indicate their home ranges are larger than what is currently published. Their new four-year study aims to address the threat by collecting data on why, when, and how anteaters interact with roadways in the more developed Cerrado ecoregion. Research results will provide insight into movement patterns to inform road management strategies and help save this iconic species. Among those supporters is Naples Zoo in Florida who recently provided funding for the project’s head veterinarian through ZCOG, an organization that provides logistical and fundraising support for New World conservation efforts. The project is still seeking funding for additional harnesses that cost $3,000 each to purchase and operate during the study period. Interested persons and organizations can donate by check or online donation through the Naples Zoo Conservation Fund noting "giant anteaters" and 100% of the tax-deductible donation will go to the project. Perhaps nothing speaks of survival and hope like a new birth. The team is thrilled to report a giant armadillo named Isabelle has given birth. 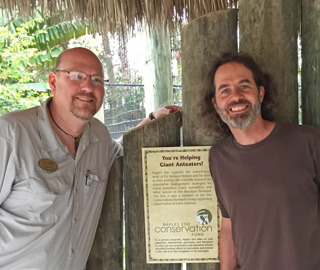 The team named the baby Tim - in honor of Tim Tetzlaff, Director of Conservation at Naples Zoo (shown here on the left with Desbiez at right in Naples Zoo in 2015). Isabelle and the Giant Armadillo Project made global headlines in 2013 when they first documented the breeding of this highly elusive species and began studying Isabelle’s male offspring, Alex. Over the next two years, Isabelle slowly revealed giant armadillo secrets from an updated gestation period of 5 months to providing much more extensive maternal care than previously expected. Those continuing discoveries ended when Alex died from injuries most likely given by a puma. It was a devastating loss for the team – emotionally and scientifically. The discovery of Tim and the video of Tim with his mother Isabelle (below) was great news for the project. And while the team must wait two years to catch up to where Alex left off, Tim’s arrival has already added key data for the species: a three-year birth interval. That indicates a slower population growth rate than once hypothesized – meaning reversing their population decline will take even longer. For perspective, an African elephant with a 22-month gestation has an average birth interval just over four years. This is the third baby the team has documented with Isabelle. Being able to record events like this demonstrates the importance of long-term projects and provides ample evidence for the team receiving the prestigious Whitley Award. Their work was also featured on a PBS Nature special entitled Hotel Armadillo in 2017. With cooperation between passionate field conservationists and dedicated partners like these, South America's wildlife wonders may just have that chance at a brighter future. Naples Zoo at Caribbean Gardens is a 501(c)(3) nonprofit organization caring for rare animals within its historic botanical garden while cooperating in conservation programs both in and outside the wild for endangered species. Accredited by the Association of Zoos and Aquariums, Naples Zoo offers guests an opportunity to experience wildlife from anteaters to zebras along with a full day of presentations and a guided cruise through islands of monkeys, lemurs, and apes. For more, click www.napleszoo.org, follow them at www.facebook.com/napleszoo or call (239) 262-5409.